My Take on it – This is a movie not many people have had a chance to see despite it getting multiple Oscar nominations including one for Best Picture. David Straitharn is great in the title role and plays the role so low key that it gives even more power to his performance. This movie is entirely in black and white and I think that it was the right decision because it gives us a more nostalgic feel. They were also able to seamlessly integrate real footage of McCarthy this way. The way that Director George Clooney shot the film in a very subtle way gives it such a powerful feel because it shows how the fledgling tv news media of the 1950’s was able to influence world events. Bottom Line – Straitharn is great here as Murrow. Nice choice to do it all in black and white and incorporate real footage of McCarthy. Subtle but powerful film about the media influence on the world even back in the 50’s. Highly recommended! Good Night and Good Luck doesn’t get the attention it deserves.The black&white photography really sets the mood and captures that particular time in history. Completely agree. Tnx for stopping by and commenting! using real footage of McCarthy really was a fab idea. The pace was a bit slow for me, but really well acted. Straitharn has such a wonderful voice. A bit slow, but worth a watch because its so powerful. Tnx for stopping by and commenting! 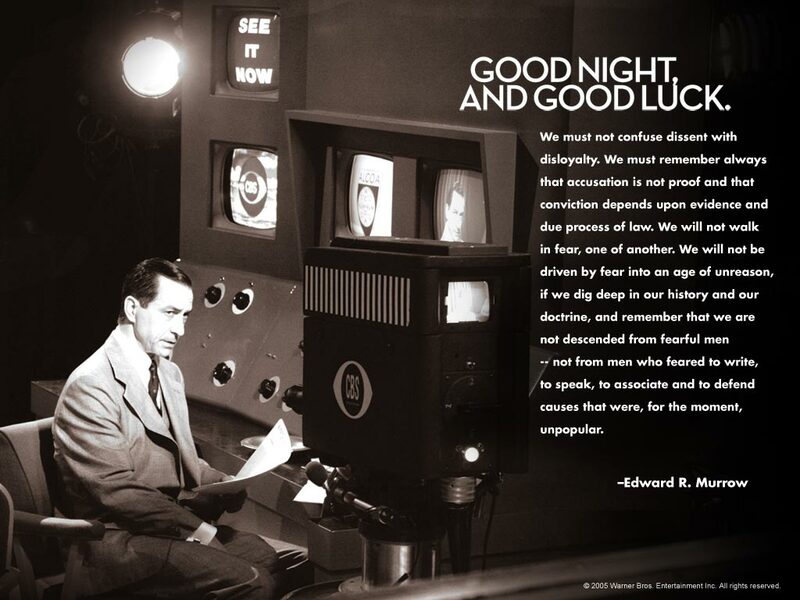 Growing up as a kid in the 1950’s, I remember seeing Edward R. Murrow on TV. He truly was a broadcast icon in those days. Watching this movie when it came out took me back to those days. An excellent movie which was unfortunately underrated. Completely agree with you! Tnx for stopping by and commenting! Oh, cool. A starring-vehicle for David Straitharn? Count me in! I’ve heard this is one of Clooney’s better directorial efforts too. Nice one Rob!